Post-docs Itay Yanai, left, and Steve Vokes. Click on the posters to download the full versions (1.6MB each). 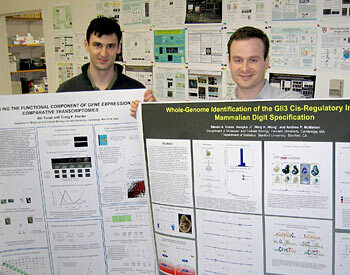 “Revealing the Functional Components of Gene Expression by Comparative Transcriptomics” won the Genome Research poster competition at Cold Spring Harbor’s “Systems Biology: Global Regulation of Gene Expression” meeting, held March 29-April 1st, 2007. Itay Yanai, a post-doc in the Craig Hunter lab, created a poster about exploring the degree of differences in gene expression between two organisms (C. elegans and C. briggsae) that are morphologically near-identical but genetically more different than human is to mouse. “To assay for gene expression we designed two whole-genome microarrays, each specific to one of the organisms, and measured levels of gene expression across the first quarter of embryogenesis. We found a tremendous amount of differences – over 40% of orthologs (pairs of corresponding genes between species) have a divergent expression pattern. In particular we found that different categories of gene genes evolve at different rates, where functionally crucial genes have very similar expression profiles between the organisms and genes not expected to be relevant to embryogenesis tend to be more different, said Yanai”. MCB took 2nd place in the contest, as well. Steve Vokes is a post-doc in the Andrew McMahon lab. His poster, titled “Whole Genome Identification of the Gli3 Cis-Regulatory In Mammalian Digit Specification” also received high honors. Vokes’ poster pertained specifically to the identification of the transcriptional circuitry directly downstream of Sonic hedgehog in the developing mouse limb bud. “Systems biology is a holistic approach to understanding how all components of a biological process interact with each other. Applying this approach is a very interesting way to revisit classic paradigms in embryonic development such as digit specification. In conjunction with conventional developmental methods, these experiments are giving new insights into the general principles of mammalian gene regulation during development”, said Vokes. Both posters are on display on the wall outside the MCB Imaging Center, 2nd floor, 16 Divinity Ave.
Vokes AbstractThe Sonic hedgehog (Shh) signaling pathway plays critical roles at multiple steps during embryonic development. Reflecting this key role, many congenital birth defects in humans are caused by mis-regulation of this pathway. Digit formation and identity in the developing vertebrate embryo is mediated by a secreted morphogen gradient of Shh. Embryos lacking Shh activity fail to form digits (except for the thumb), while embryos expressing additional, ectopic Shh within the limb bud have extra digits (polydactyly). Shh signaling is mediated transcriptionally by three Gli transcription factors (Gli1-3), which act as context-dependent transcriptional activators or repressors. Despite years of study, the distinct targets that effect Gli signaling are poorly understood. This study defines, for the first time, the complete set of in vivo binding sites for a transcription factor in the context of a distinct developmental process in a vertebrate embryo.